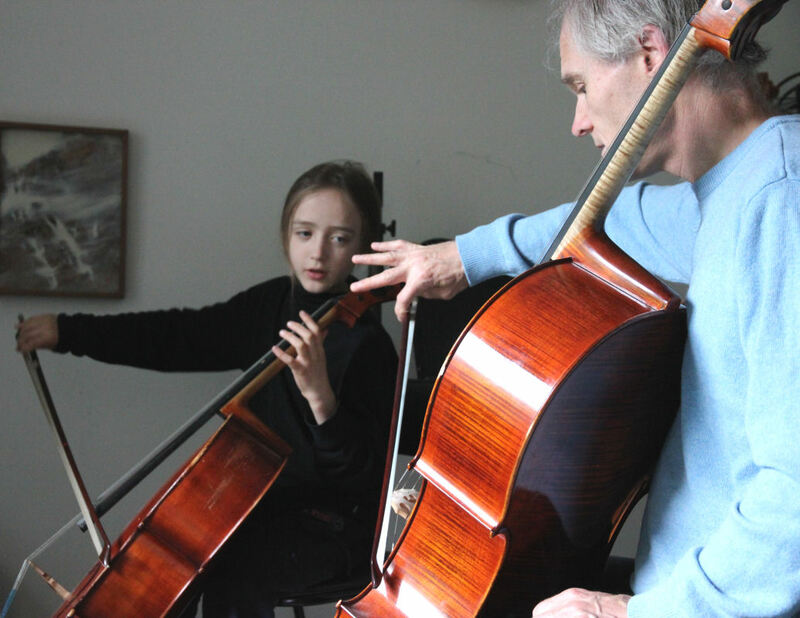 So, over a year ago, I arranged for Tal to take cello lessons with Corbin. It had nothing to do with cello, although I do love the cello. Tal had never tried one, and had no desire to. It was about Corbin's personality, and how I knew that Tal just needed somebody he could really connect with. "So Tal - this is Corbin. You remember Corbin, right? What do you think about trying out some cello, now?" Corbin expertly interjects: "So you like to play violin, hey?" "How do you like to play it?" (Tal mimics holding his tiny violin like a cello.) "Or upside down." "Oh yeah! Have you ever tried playing it with your hair? Like your own hair?" Tal's eyes just about popped out of his head. It was like Corbin was reading his mind, and he looked away, then back, as if checking to see if Corbin was still there. Then he took on a very cool posture: "Yes?" "Well you know, if you rosin your hair - you know, like you rosin the bow - then it'll work way better." Tal filled with joy. And within seconds they were comparing mouth-percussion sounds and other remarkable things. Tal went to Corbin's studio to try out his cello, Corbin bought a 3/4-size cello for us to rent for Tal, and for a year now, Tal has been playing cello. Not because he particularly loves cello, but because he loves Corbin. And he never practices. Well, never without coercion, and I admit to falling down the coercion hole once in a while, probably to the detriment of his future. He is not a virtuoso, and has repeated loudly that he will never play in public, nor will he sing with his playing. He just goes to spend time with Corbin, making up songs (which Corbin inputs to his midi program on the computer), learning to follow sheet-music together, picking out tunes Tal enjoys (but will not practice), and experimenting with awesomely odd cello-playing techniques. So after about a year, his sister decided to play guitar, and joined Tal, for back-to-back lessons, once a week. She's much more goal-oriented, but Corbin has inspired her enough that after only a few months of lessons, she now sits around experimenting on her uncle's lovely Larrivée Parlour guitar. She's become a huge fan of Melanie Martinez (who recently rose to stardom on the reality TV show, the Voice), and tries to learn the songs she's heard Melanie sing. Corbin, knowing nothing about Melanie, sees the glowing cheeks on Rhiannon and follows along, nurturing her passion for emulating a pop star as he does Tal's passion for never doing anything the same way twice. Now back to that practicing. I've tried all sorts of convincing arguments: "Imagine how awesome it would be to walk into Corbin's studio and say 'hey listen to what I can play!'" "Wouldn't it be nice if you could just pick up your cello/guitar and play that song without even thinking about it?" Etc. No luck. And when they do practice, because they feel obliged "Come on - I pay for these lessons! Can you please try to get as much out of it as you can?!" (I hang my head in shame...), then they run into each other for time, and someone invariably gets off the hook because the other is busy playing. Then it hit me: Communal music!! They were both sitting around singing Hit the Road, Jack, beautifully on key and full of joy (yet another song they learned from Melanie Martinez), when I said "hey - see if you can play that together on your guitar and cello". For some reason, neither objected. They just got out their instruments and within a couple of minutes were picking their way through it! Amazing! Who knew!? In fact they've now done this two days in a row. I don't care that it isn't one of the songs Corbin has been working on with them; they got the spark and the confidence to do this from their time with him, and for that I am extremely grateful!! I love how even when I forget, let the coercion and my own childhood experiences undercut the unschooling we try to achieve, unschooling itself is there to catch the tumbling falls. Oh isn't life beautiful!! Oh my growing-up boy. He's eleven, now. His mind is still open (and may it stay that way!). His dreams are still guiding him. And so is his blossoming heart. Bonus photo, because I like it so: One lovely Pappa presenting a cake. Today a being who once curled tiny and wriggling in my womb celebrates his eleventh birthday. And a long long day of labour, held close by my husband, mother, and brother, as my Pappa drove through a snowstorm to join us, in the night. I should have been pushing for hours, already, but he wasn't dropping down, and I was singing my fears and pains and exhaustion away. there's only love in this world! 1?am: his heart stopping, we made the decision to have an emergency c-section, and my own Pappa arrived. 1:44am: he was pulled from my open womb, the cord untangled from his strong neck, "It's a boy! ", his little bum quickly held over my blue screen for proof, and (after an agonizing time of waiting, while they assessed him) placed in my arms. That day the rest of my family came to visit, including little Hannah, her face smeared with her own 5-year birthday cake. Yes, the first two cousins in the family, and they had the same birthday! It was a late waning moon, and a long exhausting haul over those few days in the hospital, me waiting for permission to sit up, and eventually to walk; Markus tending to our every need through 40 hours with 0 sleep, until he was wavering like a swordfern in the breeze and I was afraid he'd fall over with the baby. My Mum came to relieve him, and spent the night looking after us; loving us, reassuring me that a c-section is not a failure, and helping us all move into the present beautiful moment. And after a night on Bowen Markus returned, and spent the last of the hospital nights with me, there. That was the night the nurse stole my baby. She wanted to give him formula, and I had refused. So had my midwife. She and the midwife had argued about it in the hallway, that afternoon. So she came back at 3am when I was crying, trying to feed him pumped milk from a cup (?!) as instructed, and told me I was too tired to be a good mother. She dumped formula down his screaming little throat, put him in a little plastic bassinet and wheeled him away. "I'll keep him for 4 hours, and if he wakes up I'll feed him more formula." In all my life, before or since, I have never felt so angry, so terrified, and so desperate. I think I was on the verge of nervous breakdown, and I stood there in that suddenly-empty hospital room, sobbing uncontrollably: "My baby! She stole my baby! She can't take him! He doesn't even have a name!!!" Until, within a minute or two of failing to calm me, Markus left to go find our baby. 10 minutes later, Markus returned with our son, and collapsed ontop of me, sobbing, himself. I said how could I even scream for him if he didn't have a name? And Markus caught his breath up: "Taliesin". And so he was. Markus told me that by the time he got out there, they had already given him more formula, and wouldn't let him take the baby back. So he said he would just sit there with his son and protect him, until they let him take him away. And he did. And eventually the nurse got tired and let them go. We took our little Taliesin home, to a warm and cozy house, dinner cooking for us in the oven, and welcomed him to his grandparents, his dog, his cats, and his own, safe home, where no nasty nurses come in the night to take us away! It was a dark moon, and a quiet night, and our little family was born. Tal is getting long and lanky. His shoulders are broadening. He has his first serious crush (yes he says it's OK for me to type this, as long as I don't tell who it is). He wants to go to university to study theoretical physics, and to "do research". He has greasy hair. But he's still my baby, too. And today my growing boy woke up, got dressed, and picked up a hairbrush. I think he decided that 11 might be a good age to start some personal grooming. He's very serious about these things. Both the lack of necessity and the necessity, when the mood strikes him! He had a bowl of muesli and a smoothie made with the end of last year's frozen strawberries and apples. Food from our own garden never fails to delight us!! He called his uncle Keith and his cousin Hannah, who both share his birthday, and had (with his cousin) what I think must be a typically awkward 11-year-old boy conversation: "Uh. So happy birthday. Yeah. Thanks. Um. What did you do today? Oh. Um. Um. Oh I had breakfast, and, um. Went to the beach with friends. Yeah. So what are you going to do later? Oh. Oh. Yeah." My now-16-year-old niece was patient and gracious, and it was lovely they could share a few moments, together. Tal is now out watching his friends perform their musical, and then he'll come home to a little surprise birthday cake. Rhiannon watering her beloved bulbs. But lets not forget our 8-year-old daughter. It may not be her birthday, but she revels in birthdays like nobody else I know. She loves every opportunity to make people happy, but especially Tal. At two weeks old she caught his gaze and gave him her first toothless grin. She thinks about him all the time, and she has been planning his birthday gift for weeks. I can't tell you what it is, yet, because it's experiential, and some is yet to come. But she woke delighted, today. At 6:30 she had already gone out to pick flowers for his place at the table, which, of course, she had set, already, too. She had draped pillows and fancy blankets around his chair to comfort him like royalty. She had wrapped up the Kids magazine she'd just received in the mail and placed it on his plate. And she came to ask us whether we intended to get up yet.